Fact: whether you’ve been teaching guitar for 30 years or have yet to teach your very first student, you have the potential to achieve MASSIVE success and make tons of money teaching guitar. The world’s most successful 6-figure earning guitar teachers are no smarter than you, have no more talents or potential than you and have faced the same (or greater) challenges than you ever faced in your guitar teaching. So what is the difference between the world’s top guitar teachers (those who earn at least 6-figures per year and have lots of students whose playing makes other guitar teachers drool with envy) and everyone else? If you answered with: “the world’s top guitar teachers do things differently and/or know things that other teachers do not know”, you are only half right. Yes, successful guitar teachers almost always have specialized guitar teacher training... but that is only half of what enables them to dominate their competitors. The other half consists of fundamental internal qualities and attitudes common to champions in all walks of life. When these qualities are combined with proven training and strategies on how to teach guitar, the resulting success is highly predictable. Do I have enough talent as a guitarist to get started teaching guitar? Is it even possible to become a guitar teacher and quit my day job to teach lessons exclusively? Can I really earn a lot of money (such as 100k+ per year) from guitar teaching alone? How long does it take until I make a full-time living teaching guitar? The above questions convey insecurity, weakness and self-doubt - subconsciously programming one’s mind to prepare for failure. What do I have to do to learn how to teach guitar better and more effectively than anybody else in my area? What are the best strategies I can use to build a successful guitar teaching business and make 100k+ annually? What steps do I need to take to become a full time guitar teacher and phase out my day job? How can I ensure that my business continues to grow and expand, no matter the state of the economy, the size of my city’s population or the amount of competition in my area? Notice that the questions above come from a place of strength, self-confidence and “proactive expectation” of success. Asking these higher-quality questions will lead one to the exact solutions that will MAKE success possible. The top guitar teachers in the world build their businesses with overwhelming intensity and sense of urgency. They feel that they MUST succeed as if their lives depended on it… as if they would literally DIE if they didn't reach their business goals. This “sink or swim” attitude is what drives these teachers to take MASSIVE action, leaving them no choice but to achieve equally MASSIVE success. Massive action means not only working “harder”, but working SMARTER - such as seeking out guitar teacher training to eliminate wasted time from trial and error and take the only proven shortcut to success. Note: the sense of urgency and intensity is ONLY made possible as a result of having the mindset of a CHAMPION and having strong belief in your ability to achieve success. “The price of success is ALWAYS paid in advance”. Your work ethic is your ability to sustain your massive sense of urgency over the long-term until you reach the level of success you want. Knowing WHAT to do to become a highly successful guitar teacher. When you are confident that the path you are on will lead to success, it becomes so much easier to bring yourself to do the work involved in reaching your goal. Having a supportive group around you of other like-minded guitar teachers who are either already HUGELY successful or are well on their way to building their guitar teaching empires in their area. Such a group is extraordinarily hard to find, since most guitar teachers are barely making ends meet financially, have a pessimistic mindset and lack ambition to reach true success. However, when you belong to a network of champions 6-figure earning guitar teachers, you will find it infinitely easier to reach the same status yourself. Create and enforce a STRONG lesson policy that expresses your serious expectations to your students (learn more about this in this article on making money as a guitar teacher). Contrary to popular belief, doing this will give you MORE (highly committed) students and will make your business MORE stable and profitable. A. you will be forced to become the very best guitar teacher you can be…in order to guide your students through the process of reaching their goals. B. You will start attracting more serious students - those who will practice more and take your lessons more seriously. This will build your reputation as the #1 guitar teacher in your area FAST. 1. They are able to see the bigger picture and realize that the early struggle to get their business off the ground is a small price to pay for the success they desperately desire. 2. They understand that the work involved in building a thriving teaching business is only hard in the beginning. The more successful you become, the “easier” it is to attain the next level of success in your business. This is true both for making a lot of money teaching guitar, as well as for helping your guitar students to achieve great results in their playing. 3. They are smart enough to realize that they “don’t know what they don’t know” and seek the guidance they need to build their guitar teaching businesses in the most effective way possible. 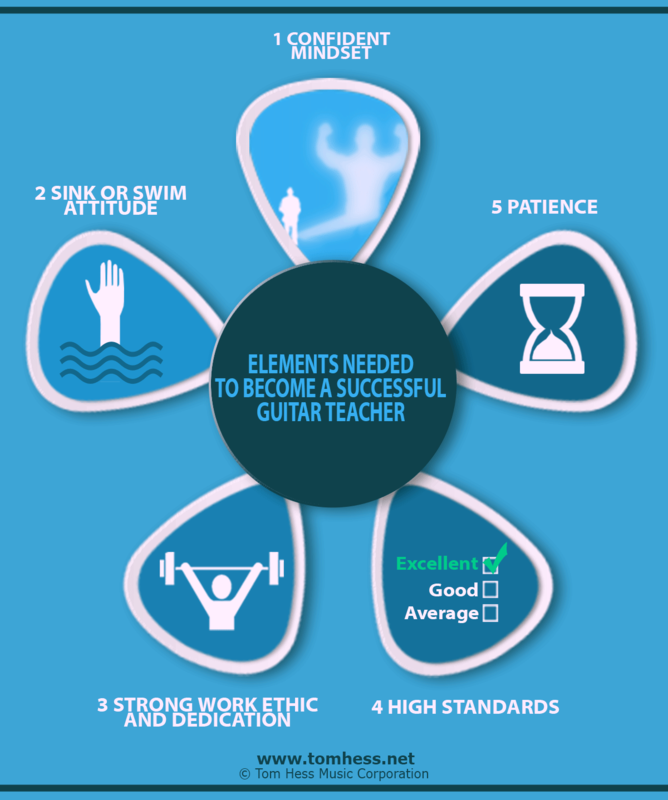 Now that you know the 5 elements needed for becoming a massively successful guitar teacher, begin putting them into practice by getting guitar teacher training so you can take your teaching business to the highest level. Earn a 6-figure income teaching guitar by getting trained by the #1 guitar teacher trainer.